Photo Caption A: Nearly 120 students and alumni gather for a career fair held at Berkeley College in Woodbridge, NJ, on June 7, 2017, to learn more about opportunities in a variety of professional fields. “In today’s digital age, people can just upload their resume to career websites, but the face-to-face interaction is still valuable for us as potential employers when meeting with students,” said Matt DiBartolomeo, University Relations Manager, Hackensack Meridian Health, during a career fair held at Berkeley College in Woodbridge, NJ, on June 7, 2017. Nearly 120 students and alumni from Berkeley College had the chance to interact with professionals in fields ranging from paralegal to fashion merchandising, marketing to criminal justice, management to health services, and everything in-between. 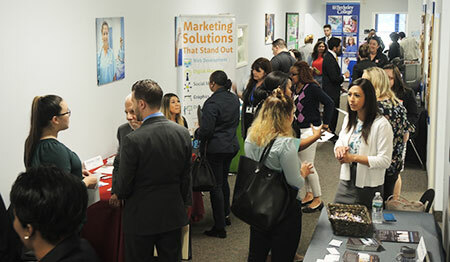 Representatives from more than 30 organizations throughout the Northeast filled the hallways and classrooms to share information about career opportunities that could potentially meet attendees’ interests and skill sets. 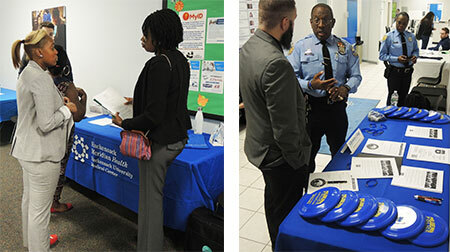 Photo Caption B: Representatives from Hackensack Meridian Health’s University Relations division (left) and the Philadelphia Police Department Recruitment Unit (right) meet students and alumni during a career fair held at Berkeley College in Woodbridge, NJ, on June 7, 2017. Gregory Spruill of Somerset, NJ, graduated from Berkeley College with a BS in Legal Studies in 2015. After gaining years of experience as a detective with the Bergen County Prosecutor’s Office, Mr. Spruill went back to school to transition into a career as a paralegal. “This career fair feels very welcoming, and is providing a lot of resources that help me transition between fields within the legal system,” he said. Photo C: Representatives from retail store Champs Sports (left) and the Middlesex County Prosecutor’s Office (right) meet students and alumni during a career fair held at Berkeley College in Woodbridge, NJ, on June 7, 2017.